So you want to write a dynamic, thought-provoking, and absolutely fascinating guest post for OpenSesame? We believe guest posts provide a unique opportunity for us to highlight new trends in the elearning industry, focus on new perspectives from elearning professionals, and evaluate new approaches to online training. At the same time, we also want to ensure our blog continues to be a cornerstone of the elearning community containing only the most engaging, informative, and exciting content for our readers. In order to paint a better picture of what we’re looking for, we created this quick 3 step guide for crafting an exceptional guest post! Include any links to research or courses. If you are a seller, we will link to your seller profile to promote your courses listed on the site. We prefer inquiries that include several pitch ideas and/or first drafts of posts. Please attach this information along with a short paragraph describing yourself and the topic of your post. Posts on our blog MUST be original content not published elsewhere on the web. This is to ensure the best SEO value. Additionally, you should be aware that OpenSesame’s editorial calendar is planned out many weeks in advance. As a result, you shouldn’t create a post about a time-specific event. Creating a post that meets the minimum requirements doesn’t guarantee it will be posted. 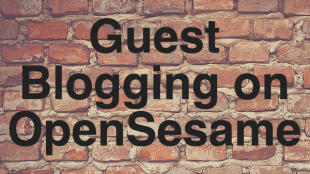 Guest posts on OpenSesame should be original, engaging, concise, and informative and should be about relatively broad topics, trends, and ideas related to the elearning industry. Here’s a few quick tips to refine and improve your potential guest post idea. Understand our audience and what they love! Though it seems fairly obvious, you should be familiar with our content and audience. Browse through our blog and take note of recent posts, interesting comments, and popular ideas. The best way to identify subjects we are interested in is to examine topics we frequently post about! Create a compelling header and introduction paragraph. First impressions are everything. Grab your reader’s attention with a thought-provoking and engaging headline before delving into an informative and equally interesting introductory paragraph. Don’t be afraid to reference and link to other sources. This is especially important if you mention an interesting statistic or recent news story. By linking to other trustworthy websites and articles, you enhance the credibility of your writing and provide an additional source for your reader to explore if they interested and seeking further information about a certain subject. Encourage readers to interact! Don’t be afraid to try and start a conversation with our readers. Include a short call to action at the end of your blog post and ask them what they think about the subject. Our readers love to comment, just make sure to respond in a timely manner! Proofread properly and thoroughly. Before sending your blog post to us, you should proofread it multiple times with multiple people. After the first time you edit your post, try printing your blog post and proofreading it with red pen. By utilizing different editing methods, you are more likely to catch hard to spot grammatical errors. If you are searching for examples of strong guest blog posts on OpenSesame, be sure to check out Effective Training Visuals—Organizing for Perception, the first blog post in the Effective Training Visuals series by Convergence Training. Also read this excellent post on Planning Your OpenSesame Training Course by Sharlyn Lauby. Please send your inquiries, drafts and ideas to our Marketing Team at blog@opensesame.com. We will review your draft and provide you with valuable feedback. Revise your post, send it to us again, so we can get it scheduled on our calendar and post it. If you have any further questions or inquiries, ask away in the comments section! We’re looking forwarding to receiving and posting some extraordinary guest posts in the future.